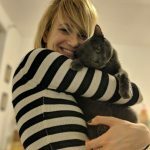 For this month’s cat cafe interview series, The Cat’s Meow had the pleasure of interviewing Kristi Labrenz, founder and executive director of The CatCafe Lounge! 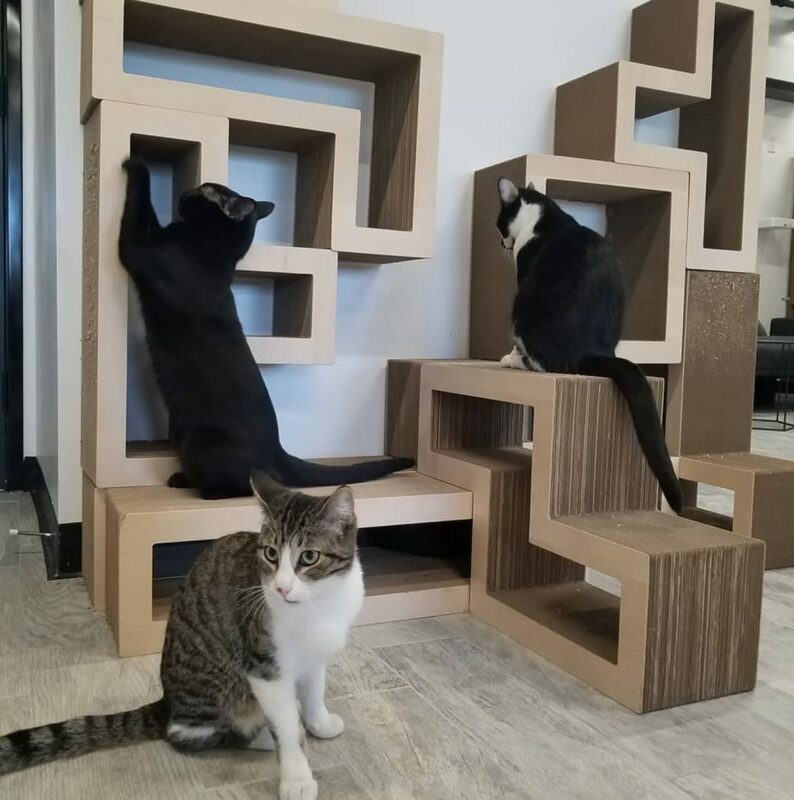 After working with big corporations throughout most of her professional life, Labrenz never envisioned that, one day, she’d be opening Los Angeles, California’s first-ever nonprofit cat cafe! We hope you enjoy learning about Labrenz’s journey to becoming cat rescue superwoman to the West Coast and the cat-loving world at large! First thing’s first: do you have any kitties that own YOU? Of course I do! What kind of cat cafe owner would I be if I didn’t have cats? Even though I am allergic, I have two. They are new additions since I lost my former cat Charles, my love and inspiration, to cancer (he passed in June 2017 and I still miss him every day). Lucaas and Earl where the light in my darkness. I fostered them after losing Charles, as I wanted to help Best Friends Animal Society Los Angeles save more lives during Kitten Season back in 2017. P. S. A. – fostering saves lives. When someone fosters, it opens up a cage for the rescue to fill with another life that needs saving. Lucaas is the beautiful short hair black, and Earl is the regal, floofy gray cat. Of course, they own me. Whatever they say goes. 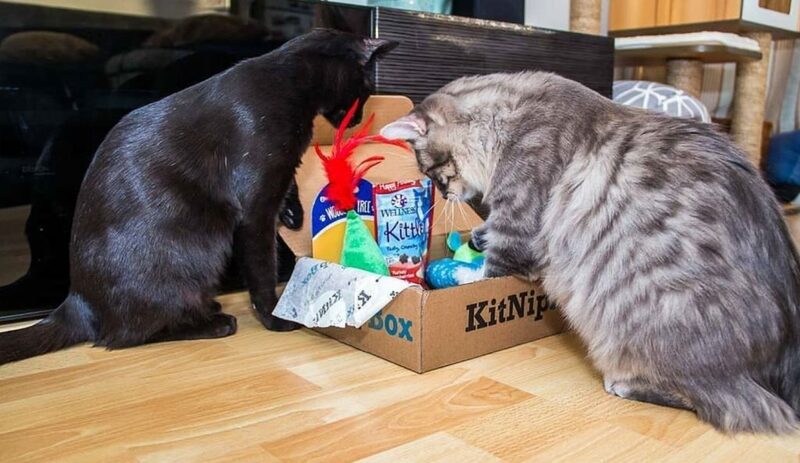 CatCafe Lounge’s execMEWtives, Earl and Lucaas, inspecting a KitNipBox! What’s your background and what inspired you to open up CatCafe Lounge? My background is in Sales and Marketing for Fortune 500 companies, as well as for startups. I was one of the first five employees at Beyond Meats’ corporate offices in El Segundo, CA. My inspiration came from an experience I had in a cat cafe in Japan in 2015. I thought, why wouldn’t we replicate this concept in the U. S., but have cats available for adoption? After that trip, I was pleasantly surprised to find out that there were already five cat cafes in the U. S. That was my PROOF OF CONCEPT! So, I dove right in! Today, there may be one, sometimes two, in every major city. So many cats are getting a second chance. How many cats are currently roaming CatCafe and how many adoptions has CatCafe helped facilitate? 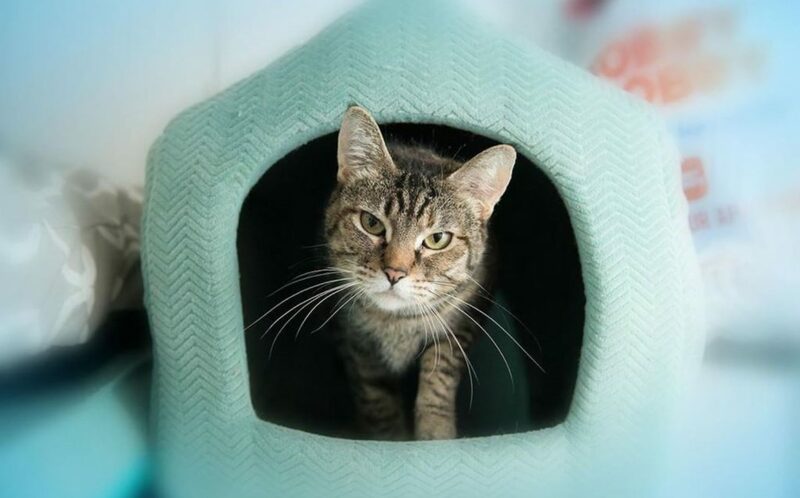 We have anywhere from thirty to thirty-five adoptable cats, depending on the number of adoptions we’re facilitating. So far, in the past three weeks, we have adopted 16 cats to forever homes. How is opening up a not-for-profit different than opening up a for-profit business? It’s a TON of paperwork! But, seriously, I wanted our consumers to feel good about their visit. Opening up a nonprofit requires transparency of the organization. Everything customers spend at our cat cafe goes right to our mission of reducing euthanizations, increasing adoptions, and socializing cats. What were some of the challenges you’ve faced since opening? Two bad landlords and one even worse tenant. Specifically, the tenant below us cut all off all of our utilities and then was busted for not having permits. They left us stranded! We fought for five months with the landlord and tenant. At the end of the day, they took the approach of “David vs Goliath”. We weren’t coming from the same economic position as they were, and thus couldn’t file suit, so they dug their heels in. All of this happened while we were mid-construction and had already sunk a ton of money into building out our space. In the end, we made some financial concessions in order to become operable. One concession was the delay of our CATIO build-out. Hopefully, we can resume building this enrichment space and have it completed by the summer of 2018. What’s the best part about running CatCafe Lounge? The adoptions are awesome, but, for me, the best part is cat delivery day. There is a special moment when a new cat comes out of their carrier and puts their paws on the floor. They instantly know their life has changed positively for once, after enduring so much stress and anxiety at the shelter. Any funny or unique stories about the cats you’ve saved? So many, but, specifically, Bob. Bob was labeled as “aggressive” in the shelter, but our rescue took a chance on him and brought him to us. After a week of hiding, he came out of his shell and became known as the “[human] ladies man”. Bob would seek out all the ladies and sit like a baby in their arms for almost the entire duration of their visit. How do people typically spend their time at CatCafe Lounge? On the floor, snuggling and playing with the kitties, or in a comfy chair with a cat on their lap. 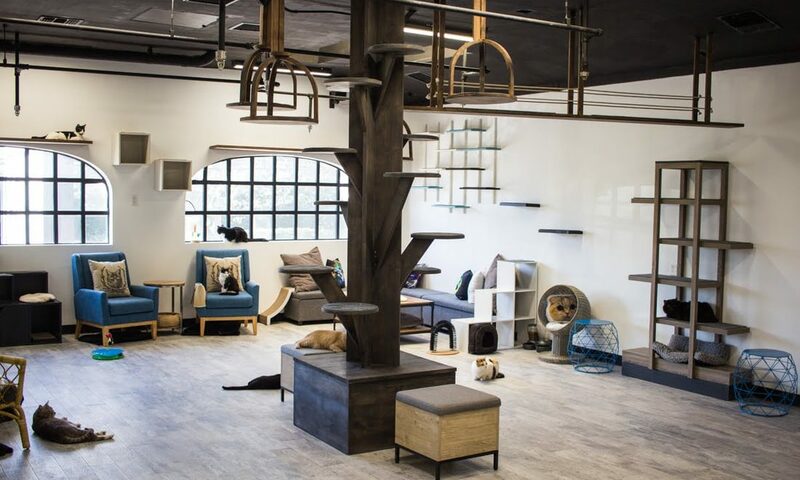 We have so many unique spots for the cats to lounge and interact with guests, specifically the 10-foot chandelier tree, or the birch forest. What’s the one thing you wish you knew before you decided to open up a cat cafe? I knew saying goodbye when they get adopted, would be hard, but I didn’t realize how hard it would be. We share a bond with each cat that comes to us. Whether it’s on delivery day, or when the socializing that we do comes to fruition and they come out of their shell. I get so attached! At the end of the day, when one of our cats gets adopted, we have the opportunity to fill a new open space in the lounge. We can save another cat from euthanization. It’s bittersweet. We all cried many times when the first couple of cats were adopted. Happy tears. Are there any other people or businesses in the cat industry that you admire? Best Friends Animal Society. The work they are doing to move the nation to no-kill by 2020 is progressive and awesome! 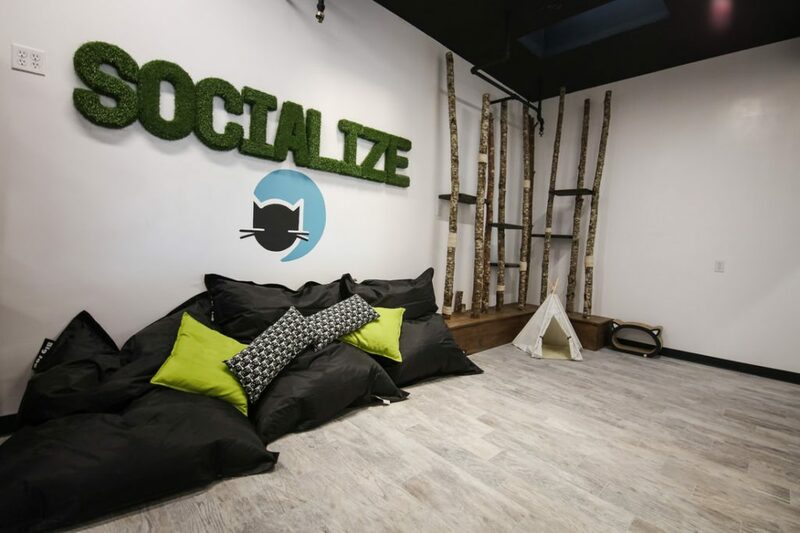 Do you plan to expand CatCafe Lounge to other locations in California or the U. S. A.? Our long-term goal is to add locations around LA to provide rescues/shelters a much-needed outlet for overpopulation.